How to design Triangular Shawls – A tutorial by Make My Day Creative. This tutorial works for knitting too! Triangular shawls are a great way to place to start with designs involving increasing and decreasing. It’s easy to see if your design is coming out how you like from the beginning. And you can modify them to make scarves in the event of a yarn shortage! Last time I looked at how to increase and decrease in a stitch pattern. Once you have your increase or decrease figured out you can turn your stitch pattern into a triangular shawl. 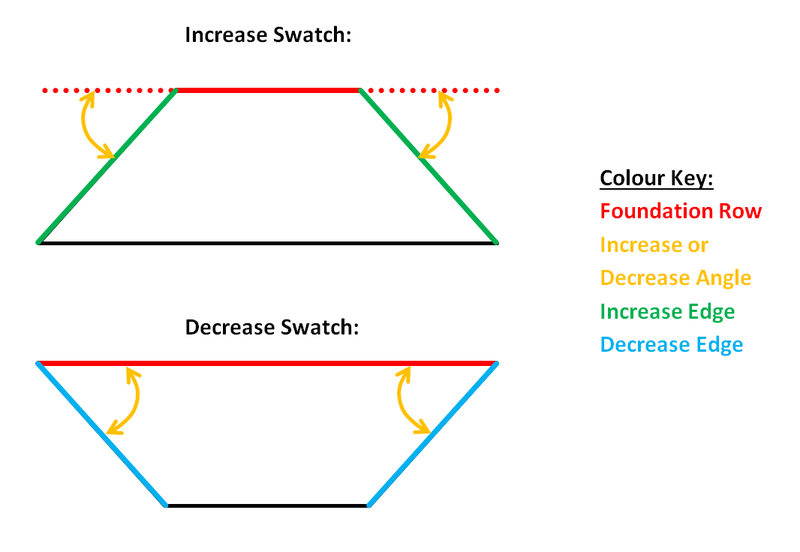 All you need to do is consider a few details such as the angle of your increase/decrease, your desired overall look, and then choose a construction type. Your yarn choice may also affect your construction preference particularly if you are using a gradient or long self-striping yarn. What is the angle of decrease/increase? When I talk about the angle of increase or decrease, I mean the angle made measuring from the horizontal row to the edge. Lay your sample swatch out with your foundation row at the top. If you are increasing then the angle is measured from the horizontal edge projected out to the edge of the work (i.e. not across the work). For decreasing, the edge is measured from the horizontal row to the edge of the work (i.e. across the work). There are several ways of making a triangle shape: top down, bottom up, centre top out, sideways, diagonal – and I’m sure there are more but I’ll stick to these for now! Each of these shapes will require your stitch pattern to be increased, or decreased, or both. I have put together a handy pdf Quick Reference Guide on these types (download HERE). 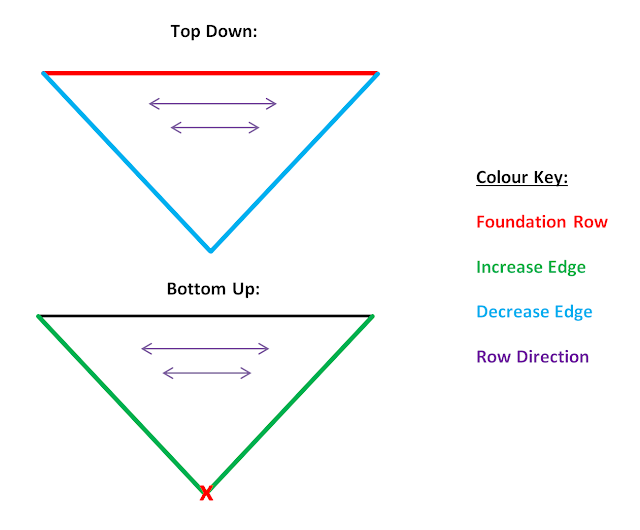 A top down construction begins by making a foundation row which is the length of the top edge. This is then decreased on both sides of the row so that subsequent rows get shorter and shorter until you end up at the tip. The foundation row can be a bore but subsequent rows get faster and faster. This construction has the benefit that you can stop part of the way down your shawl and turn it into a scarf with tapered ends if you find yourself short on yarn. A trapezium shape can also be turned into a multiway scarf/shawl, like my Multiplicity Lace Shawl. If your decrease angle is 45° or less this shawl will work well. The more acute your angle is the shallower your shawl will be. Summer Sprigs Lace Scarf is made with an acute decrease angle and is quite shallow for its wingspan. 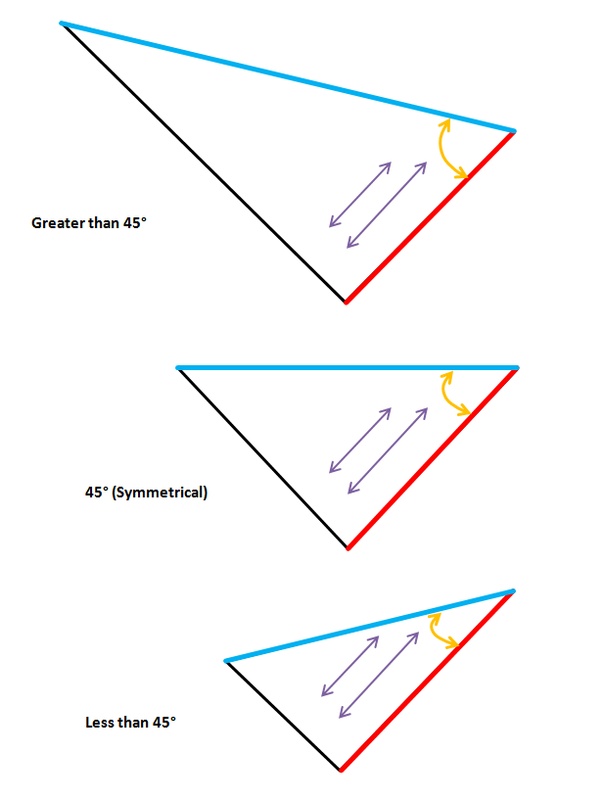 If your decrease angle is more than 45° then the shawl will be very long for its wingspan. A bottom up shawl begins at the centre corner opposite the long edge and increases with each row until your shawl is the desired size. This construction has the benefit over a top down method of avoiding a long foundation row, but if you run out of yarn you could wind up with a neckerchief rather than a shawl! You will need to begin by making a single repeat of your pattern. If your pattern repeat is long (e.g. more than 10 sts) but you wish your shawl to end in a sharp point, you may want to crochet a small plain triangle (mesh works well) as the foundation. As with a top down construction, if your increase angle is 45° or less this shawl will work well. The more acute your angle is the shallower your shawl will be. 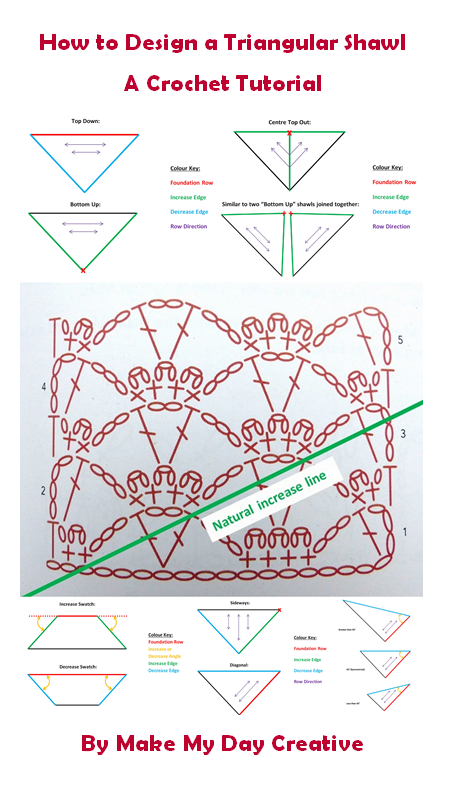 If your increase angle is more than 45° then the shawl will be very long for its wingspan. Make your foundation row a small, odd number of stitches (e.g. 5 or 7) and increase until you have enough for two pattern repeats, plus a central stitch. Centre top out can look confusing. I tend to think of it as two bottom up shawls joined together along their short sides using a central stitch. If you can make a bottom up shawl then you can make a centre top down shawl! The increase angle is quite important for this construction type. If it is not 45° (or very near it) then the shawl will not be triangular. An increase angle of less than 45° will also work, but instead of being a triangular shape the top edge will be dipped towards the tip. This is actually a nice shape to make because the ends can wrap around the body more easily. A sideways shawl is made by starting at the tip of the long edge and increasing on one side only. Once the central point has been reached (make sure you use less than half your yarn!) then decreases are made on the same side of the work. Working a shawl this way makes rows which run vertically up and down the shawl. 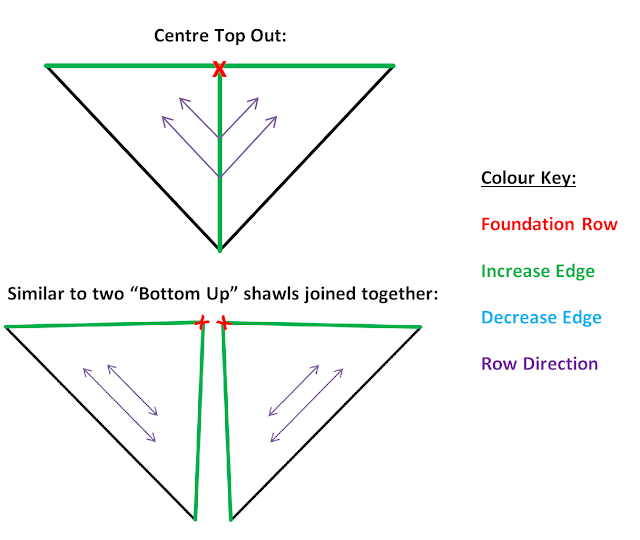 To ensure you get a symmetrical shawl, make sure your decrease and increase angle are the same as each other! This construction type is a good option if your increase and decrease angle are more than 45°. The greater the angle, the shallower the shawl will turn out to be. 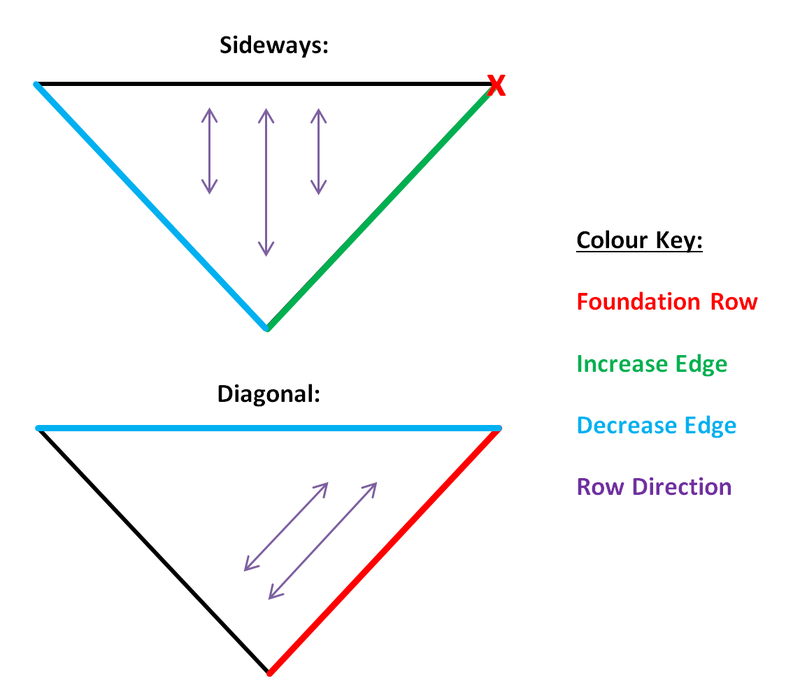 A diagonal construction is worked by making a foundation row which is the length of one of your short sides. This is then decreased on one side only – this side becomes the long top edge. Rows run diagonally across the shawl – in a similar manner to my Shooting Stars cowl (although this is a different construction type the effect is similar). If you are looking for a symmetrical shawl then you will need to use a stitch pattern which has a decrease angle of 45°. However, asymmetric shawls can be an interesting alternative, so this is a good option if your angle is much bigger (e.g. 60°) or smaller (e.g. 30) than 45°. I say this because that way the asymmetry looks like it was on purpose and not an accident! 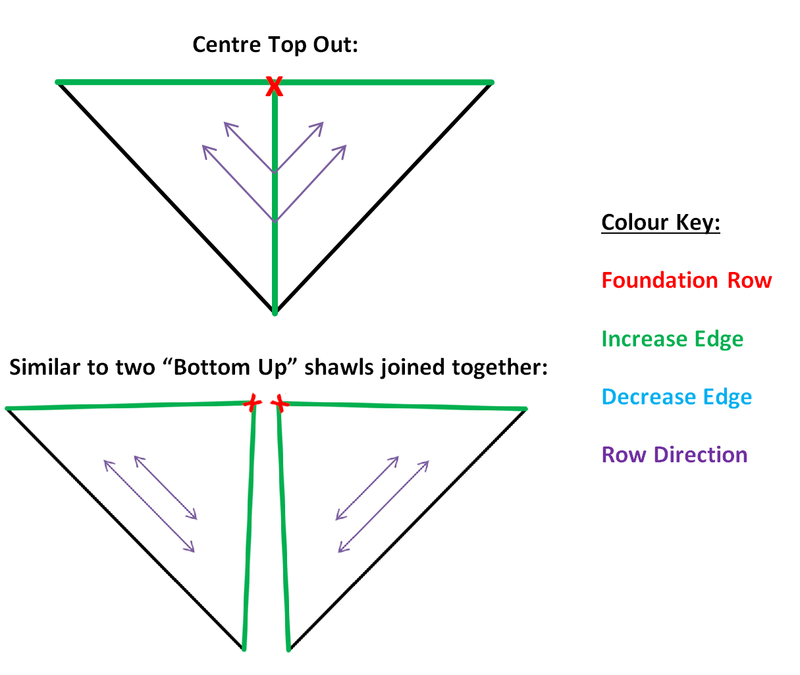 For asymmetric shawls with a large decrease angle (more than 45°), the foundation row will work out as the shortest edge and for asymmetric shawls with a small decrease angle (less than 45°), the foundation row will work out as the second longest edge.